Blockchain networks are secure, redundant and self-healing. When deployed they “build trust, reduce costs and accelerate transactions”. The quote comes from IBM. The company has more than 1,000 staff and $200 million invested in the blockchain-powered IoT. Deployments have been made by Maersk, a cargo shipping giant, and Walmart, the world’s biggest retailer, but small and medium-sized enterprises can obtain similar benefits. Blockchain is a mainstream development that really does break new ground, as did the Internet and voice followed by video over IP. The business benefits are significant, and they derive from a technology that is fundamentally different and they can be evaluated in low-cost pilot projects enabled by service providers. 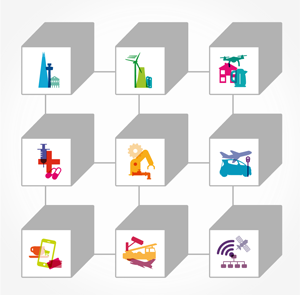 Moreover, blockchain can be deployed as a network that overlays the legacy IoT infrastructure. Therefore, there can be no negative impact: ideally performance will be enhanced. Blockchain was originally created for the Bitcoin digital currency, but that is history and it is not particularly relevant for B2B applications like the IoT. However, the financial-centric term ‘ledger” continues to be employed in contexts that mean a ‘record’. Blockchain’s distributed ledger technology uses a network of computers, referred to as nodes, record, share and synchronize transactions in their respective ledgers. Blockchain uses the term ‘block’ to indicate a data container that can hold the transactions — more than 500. When linked together they form a chain. Security is a major business issue. There are more and more IoT sensors in vehicles, factory machinery, buildings and smart city infrastructures, which means that attack surfaces are growing. In addition, data transactions are also taking place between different networks owned and managed by different organisations. Progress is raising the security bar. Blockchain addresses the issue head on: security is an integral part of the technology. Decentralized interaction and data exchange bring scalable, distributed security and trust to IoT devices, applications and platforms. Hashing algorithms create an unchangeable record of transactions: information is encrypted and can only be accessed through public and private keys. The number of one-on-one interactions in a large business ecosystem can make the transactions costly, inefficient, opaque and vulnerable to mistakes and fraud. However, blockchain technology allows ecosystem partners to have a common view on a shared distributed ledger of the data that was exchanged. Processes that used to be complex are simplified and there is a rise in transparency and trust. There is no need to take a deep dive into blockchain technology in order to make a pragmatic start. There are mainstream companies that provide blockchain as a service for businesses that want a cost-effective way of testing the waters. They include Amazon, IBM, HP, Microsoft, Oracle and SAP. In addition, there is a growing list of smaller solution providers having specialist knowledge of vertical sectors such as healthcare, which has stringent regulatory requirements. We’ve only scratched the surface of blockchain’s capabilities but the future looks bright. While the majority of today’s blockchain efforts are still in technology discovery and proof-of-concept stages, now is the time to explore how blockchain can apply to your data flows and specific use case. However, to meet enterprise requirements solutions based on established frameworks that allow interconnectivity between disparate blockchain networks will be needed. Your definitive monthly guide to finding the right IoT platform and understanding the fast-moving platforms market, from the team behind IoT Pilot – the independent, analyst-driven online IoT platform finder.